Redlands is home to a number of public parks and nearly 30 miles of hiking and walking trails—many of which are dog-friendly. Any newcomer to the University of Redlands who has looked at the website, read the viewbook, or gone on an admissions tour knows that here at the U of R we are enviably close to mountains, desert, and ocean. You can ski in the morning and go to the beach in the afternoon. Theoretically. 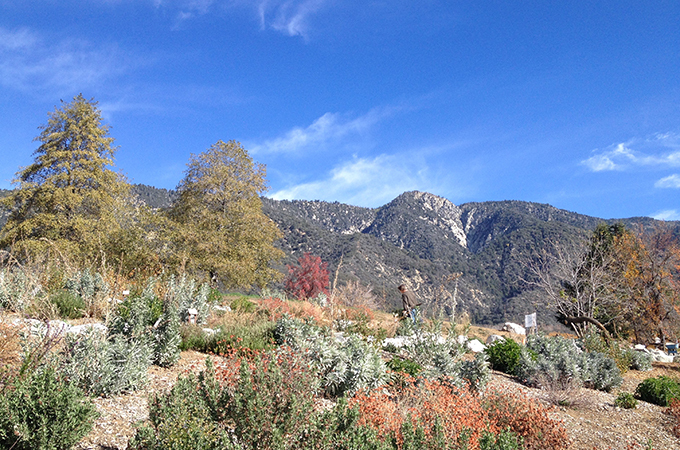 If you’d rather set your sights a little closer to home, or if you’re just looking to explore Redlands’ more immediate surroundings, here’s a sampler of enjoyable hikes in and around the city. 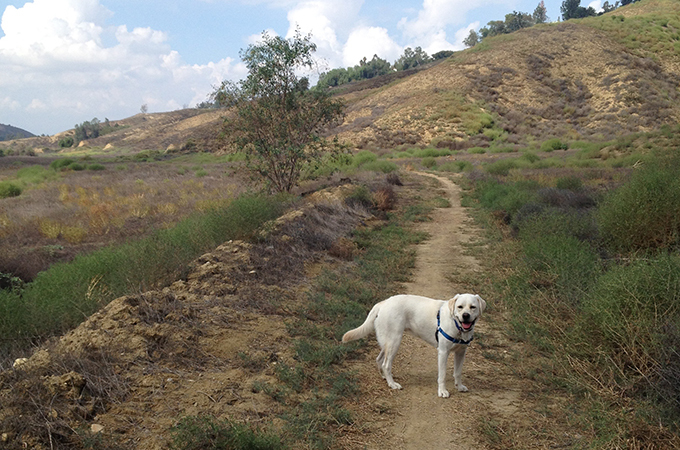 Expect to share the San Timoteo Nature Sanctuary trails with mountain bikers and runners, as well as canine friends. Drive over the crest of the hill in South Redlands, where Sunset Drive meets Alessandro Road, and the sight that greets you is guaranteed to lift the most jaded spirits. 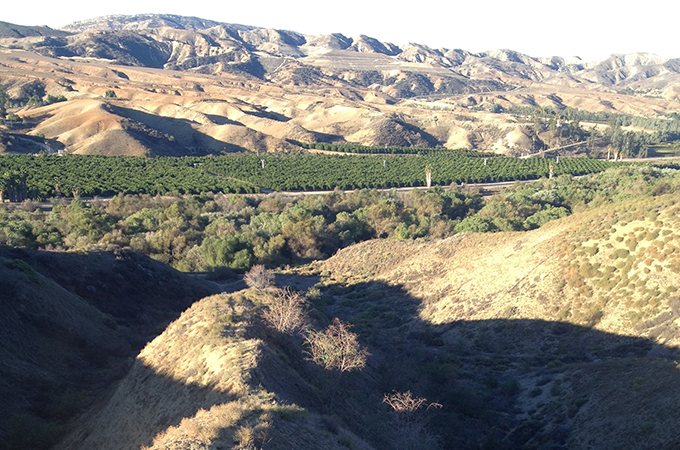 The foothills of the San Jacinto Mountains rise up majestically ahead and as you pull into the parking area to the right, before you reach the railroad tracks, a wide former carriage trail beckons you to explore San Timoteo Canyon. For a mile or so you’ll be walking on a flat dusty path on the valley floor, with the folded flanks of the canyon rising up beside you. A little further on you can climb up into the hills to reach a viewing bench offering one of the most expansive and uplifting views around. To the end of the trail and back nets you around five miles or so, making this an easy yet rewarding outing. Expect to share the trail with mountain bikers and runners, as well as canine friends. 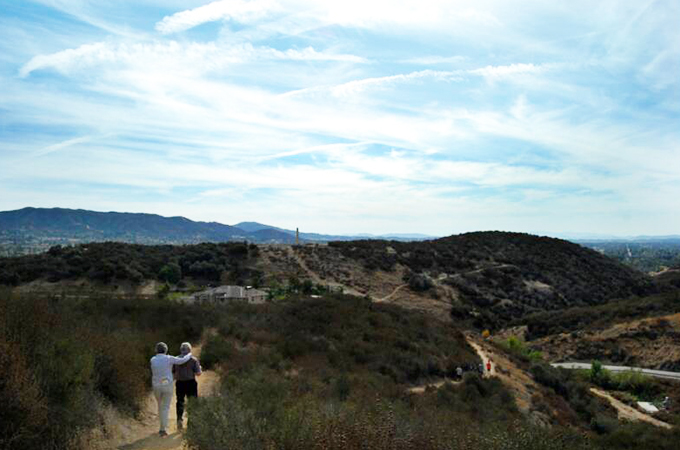 Oakmont Park offers a steep path that hugs the hills, with dramatic switchbacks and stunning views in all directions. A little tricky to find (it’s off Sunset Drive to the east of San Timoteo Nature Sanctuary, but with a few twists and turns), Oakmont Park is well worth seeking out. From the parking lot you’ll walk through a shady picnic area that leads to trails in several directions. Follow the one to your right and you’ll quickly ascend a steep path that hugs the hills, with dramatic switchbacks and stunning views in all directions. Opt for the path to the left and you’ll find yourself meandering a gentler trail through the valley. If Fido is along for the hike, this may not be the best choice: spiky goat’s head thorns abound! The Crafton Hills Open Space Conservancy offers trails that zigzag through low hills before opening up into a wide path that follows the ridgeline, offering a breathtaking panorama of valley and mountain views. Keep driving east out of Redlands on Highland Avenue and before long you’ll reach Crafton Hills Community College. Turn left into the campus and follow that road past all the buildings until you arrive at a small parking lot at the head of the College Trail. 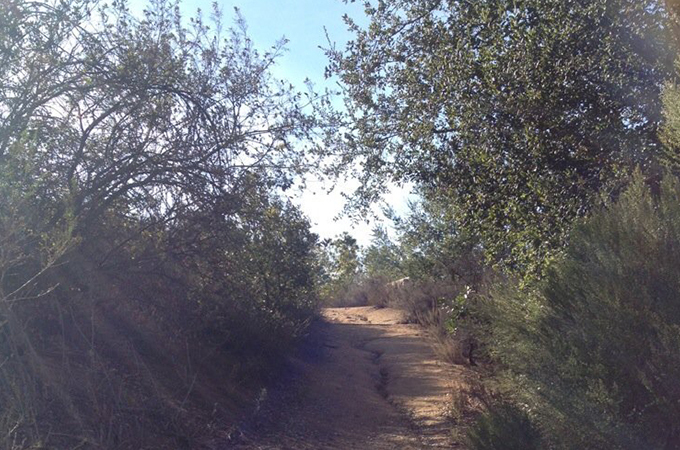 The Crafton Hills trail system covers a huge area, with numerous trails all worth exploring. This one zigzags through low hills for half a mile before opening up into a wide path that follows the ridgeline, offering a breathtaking panorama of valley and mountain views. If you keep walking another two miles or so you’ll start to head towards the foothills of the imposing San Bernardino Mountains. A riot of color in spring, when the wildflowers bloom, this trail is beautiful any time of year, though beware of rattlesnakes in the warmer months. Oak Glen is home to the Oak Glen Preserve, a 2,000 acre protected area with trails that take you past ponds, streams, wetlands, oak and pine forests, chaparral, and willow woodland. 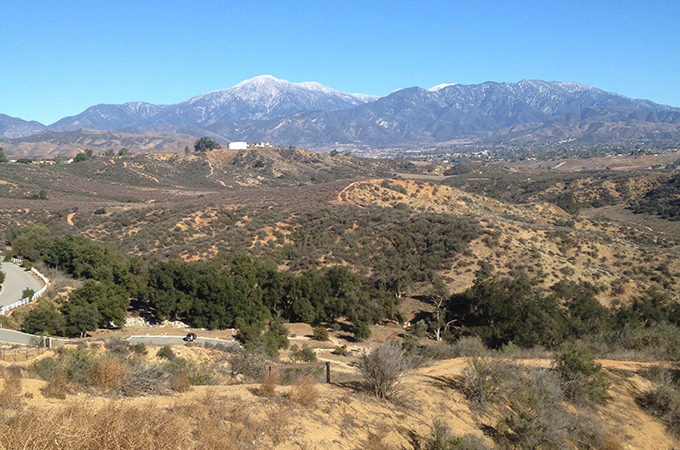 Oak Glen is known for its orchards and apple picking, but this lovely spot close to Yucaipa is also home to the Oak Glen Preserve, a 2,000 acre protected area with trails that take you past ponds, streams, wetlands, oak and pine forests, chaparral, and willow woodland. The parking lot is at Los Rios Rancho, Southern California’s largest historic apple ranch. Budget time on your trip to stop in at the ranch store and pick up an apple pie or apple cider to take home. If you’re here at lunchtime, don’t miss the slow cooked BBQ for sale in the restaurant. Redlands Environmental Studies Professor Tim Krantz directs the botanic garden here, which is filled with native plants and the hummingbirds and butterflies they attract. If you plan to bring your pooch, you’ll need to keep him or her on leash. The loop trail at Caroline Park is a delight, featuring an abundance of wildflowers, mountain views, lizards, and rabbits galore, and a grassy meadow on the eastern edge of the park that’s perfect for picnicking. If you want to get away from it all and stay within the city limits, you can’t do much better than Caroline Park, which skirts the edge of Sunset Drive in South Redlands. The loop trail here is a delight, featuring an abundance of wildflowers, mountain views, lizards, and rabbits galore, and a grassy meadow on the eastern edge of the park that’s perfect for picnicking. Dogs are allowed, on leash, and poop bags are provided.